Back to the shelves of World Market. Currently they're selling some offerings from a company named Chocolate Chocolate Chocolate Company. I'll say it once and then no more: I do think that name is a bit ridiculous. 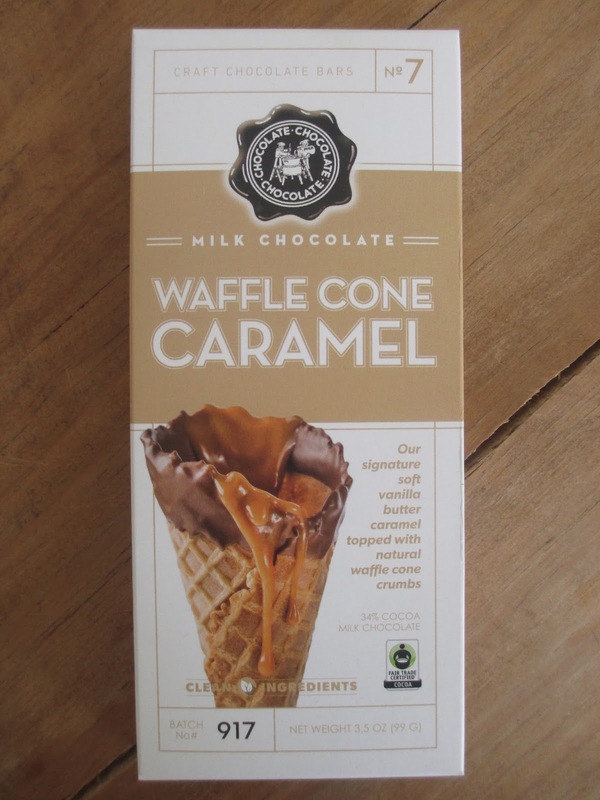 While the Waffle Cone Caramel Milk Chocolate that I chose to try first didn't appeal to me too much in the store, at home it is in fact rather appetizing as a dessert milk chocolate. The style of the card box has quite a bit going on but tends to look simpler than it is because of all the neutral tones: white, tan, and brown. The food photography is fine. I do like that the Fair Trade logo is there but the packaging otherwise doesn't make a big deal out of it (the company converted to fair trade chocolate in 2014, a decision I'd love to continue see happening with more companies). I don't, however, like the "craft chocolate" label up on top: it should be obvious from a chocolate's traits, not its labels, that it's craft chocolate (and actually I don't know that I would call this bar craft chocolate, so trying to call it something that it isn't hurts my impression of a product rather than improves it). Inside of the box, the chocolate bar comes in a clear wrapper instead of foil. On one side, you can see a solid surface divided into eight squares. On the other side, there are sprinkles of ice cream cone pieces. The look of the clear wrapper plus the sprinkled cone reminds me of those chocolate bars that you can "design" yourself (you know, the ones where you go online and choose what ingredients you want them to throw on top). Or of chocolate bark. This is neither good nor bad. The aroma? Vanilla, like the chocolate in a confection shop, all sweet and nostalgic like that scent on Main Street, USA in Disneyland. Ah, I do love Disneyland. There is a surprise when you bite into this chocolate. No "the caramel flavor comes from the vanilla in the chocolate." No "crunchy caramel" that's more like toffee. No, no. Here there is in fact caramel inside of the bar. The caramel is inside of each square; it doesn't quite reach to the edges of the squares, so think of it as similar to the Caramel Ghirardelli Squares. I don't come across this use of caramel often. It's more of a candy bar approach to a chocolate bar, I guess, and yet it's for that very reason that I like the style. In fact, I like the entire concept of this bar much more than I thought I would. The caramel gives you some chewy texture and some flavor for those moments when you don't get as much crunch from the pieces of cone (which, as you can see, aren't exactly evenly sprinkled since they sit away from the edges). The solid chocolate edges of the squares give you a little extra vanilla chocolate time for variation to it all. I just wish it all tasted better. Don't get me wrong; it doesn't taste bad. It just doesn't taste great. 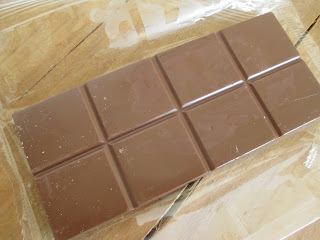 The taste is nice as a casual chocolate, something you can eat quickly when it's a confection-type experience you want. But I just wish it were better. The chocolate is very light (there is no listed cocoa percentage), so it tastes more like sugar and vanilla than chocolate; this is, however, typical for confections. The caramel tastes similar to the caramel in Rolos, though certainly better and not nearly as rock hard as those candies tend to be. The ice cream cone pieces are typical ice cream cones: crunchy without much particular flavor. I think I'm fine with how the caramel is, though, and even the cone; it's the chocolate that I need to be better. With that said, I'll still happily eat the rest of this bar, and if someone gave me another one I'd probably get excited to eat it, as well. Because we all do like to eat sweets sometimes and since I don't buy a lot of other sweets, milk chocolate is one of my sweets. I do think that the concept of this bar works well; if you look at it as a confection, it's good. If the chocolate were a little better, then the concept would be elevated into the gourmet candy bar type of zone.